Together, we can give working animals a better life. The air is thick with choking dust. The summer heat--well over 100 degrees--is searing. In the miserable conditions of India’s brick kilns, working horses, donkeys and mules are pushed to their physical limits day after day, hauling massive loads on their backs from dawn until dusk. This punishing existence is the everyday reality for thousands of working animals throughout the developing world. Many of them work with life-threatening injuries and suffer from poor nutrition and dehydration. The future is grim for these animals, as their owners are also struggling to make a living in these brutal working conditions. Many owners simply don’t have the resources to care properly for their animals. We believe that animal suffering is preventable, and that good animal welfare protects human livelihoods. Brooke USA is an organization that funds programs designed to improve the lives of working horses, donkeys and mules. On-the-ground animal welfare teams work in some of the most challenging areas of the world to help relieve immediate suffering and create lasting change. Your gift could help lighten the load for working animals across the globe. We rely on the support of our generous donors to expand our reach, helping more owners maintain their livelihoods by providing them with the skills and knowledge they need to give their animals the care they deserve. Meet Raju, a working horse in India. For eight hours a day in oppressive heat, Raju and his owner Mohammad haul freshly dried bricks by cart to a kiln to be fired. It’s tough work that takes its toll. One day Mohammad noticed that Raju had stopped eating and was losing weight. Concerned about Raju’s health and fearful of losing his only means of income, Mohammed contacted a Brooke mobile veterinary team. They discovered that Raju had a digestion problem caused by a mouth ulcer, the result of extreme heat, dehydration and poor nutrition. After Raju’s condition was stabilized, Mohammad met with the Brooke team and gained vital knowledge that he could apply directly to his daily life with Raju--like the importance of proper feeding and adequate rest, as well as basic first aid training. 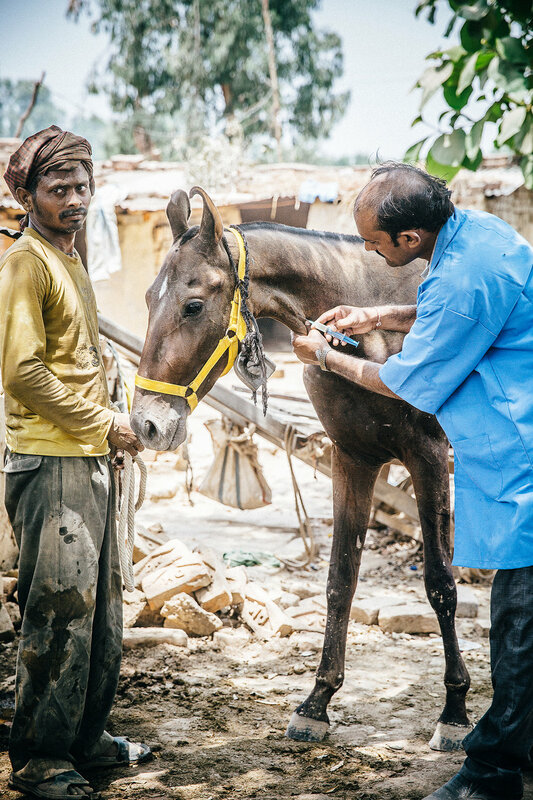 In Mohammad’s area, there are many brick kilns where thousands of people and equines work together. Brooke USA funds vitally important programs in these communities that are designed to prevent animal welfare problems and help owners gain and share knowledge on the proper care of their animals. You can help build a better life for hard-working animals like Raju. In fact, with an extraordinary gift of $100, you can sponsor a Brooke Brick* that will directly benefit the Brooke Brick Kiln Projects in India. Your gift will support the ongoing work to help alleviate the suffering of working animals now, and in the future. Please act today to help build a better life for some of the most vulnerable animals on the planet. To order your personalized brick, please visit BrookeBricks.org. *Brooke Bricks can be personalized and will be included in a commemorative walkway at the Tryon International Equestrian Center. All bricks will be made of bricks manufactured humanely in the United States.